Yes I know this is not the work that I normally post but it is a part of what I do and an example of being prepared to capture a vision no matter what I am shooting. Most photographers know that the best light can happen even before the sun pokes out over the horizon. Getting up early is only part of the equation. This spot on George Lake in Killarney Provincial Park is quite accessible and relatively close to the campground but I still made point to visit the day before and scout the location. With my dog accompanying me I knew there was a bit of a rock obstacle in our way and he would need help with a small climb, so I was prepared for that in advance. With the coming of fall light sunrise happens in a much shorter time frame than mid summer, so its important to pick a spot to shoot from as time may not allow a change of location, so again preparation is paramount. In my personal artwork I like to present it in large and non standard formats so in this photo shooting a panorama is much easier when you not only have the right gear, but knowing how to set it up and do it efficiently. Once that process happens I can let myself get immersed in the moment, create art and experience the vision I came with. This shot was an added bonus and with a lack of a portfolio quality sunset on my first night, I looked for something else. 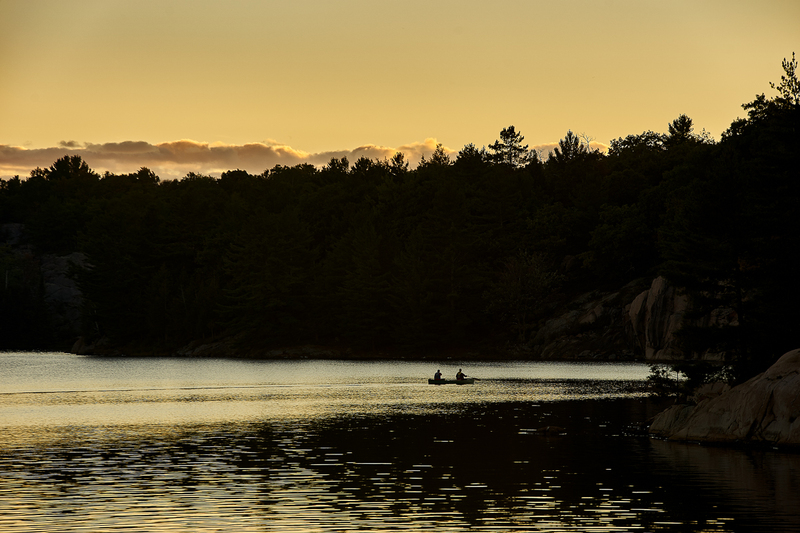 In this case I found a shot of these fishermen in a canoe and I think it represents the romance and mood of Ontario's outdoors perfectly. But again I was prepared to shoot this both by having the right gear (in this case a 70-200 zoom) and the knowledge of how to use it, getting a sharp in focus shot in low light. As a photographer I try to be prepared in anything I shoot and I take a lot of time to develop my skill to the point where I believe I can shoot in almost any situation both in nature and in the studio. I do sell my fine art photography as a separate business from my commercial work and you can view this work at www.robertgreatrix.com or on our Instagram feed @robertgreatrix Our fine art sales are handled through our friends at Liss Gallery at 112 Cumberland in Toronto's historic and trendy Yorkville neighbourhood.